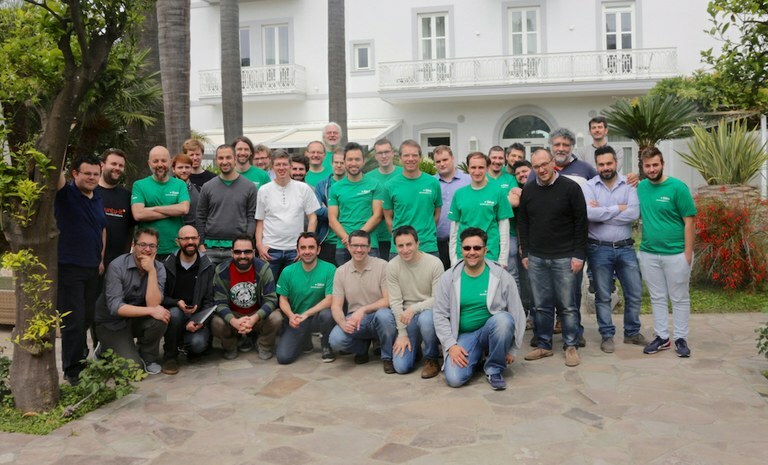 The first OCA sprint in Italy was held in Sorrento, from 26 to 29 April 2016, with a focus on financial reports for Odoo 9.0 Community: here are the results and feedbacks from the attendees. More than 30 Odoo enthusiasts coming from all over Europe, joined us during the 4 days of the sprint. Abstract thanks the Odoo Community Association (OCA) and all the participants for this awesome meeting, held in perfectly open style. The main goal of the sprint was to improve financial reports for Odoo v.9, like General Ledger, Partner Ledger, Trial Balance, Partner Balance, P&L, Balance Sheet and more. Date Range is a module to create ranges of dates to use in your own filters. It is already reviewed and merged in the server-tools repository. Using the Date Range module we can reimplement features like fiscal year and fiscal period, which were removed in Odoo v.9 Community. You can see Data Range module at work in the Tax Balance report. MIS Builder is now available for Odoo v.9. Beyond this, MIS builder was improved to create advanced fiscal reports. This way, it fills a gap of Odoo Community since dynamic fiscal reports are available only as an Odoo v.9 Enterprise module. Also, MIS Builder is able to export reports in XLSX format, thanks to the base_report_xlsx module. If you want to delve into details, check out the sprint Trello board. All the answers are in this PDF, and most of them share a common positive opinion about the beautiful location, good italian food, nice welcome informations and decent internet connection. Glancing through the answers list, we would expect better and stronger relations among participants, as well as a greater ability to contribute to OCA activities in the future. How to improve in 2017. To improve the quality of the agenda and activity planning, sprint leaders need to provide to the event enough time before the sprint takes place. Unfortunately, this is quite complicated, everyone has their own job/duties! A possible solution could be to let the leaders meet in Sorrento one day in advance, before the rest of the sprinters arrives. When OCA started the sponsorship for financial reports, the event communication turned a little away from what we expected. That was a bless :), nonetheless, in the acceleration to do it as quickly as possible, we ended up with two different places to provide information and to collect more sponsors and registrations. We'll try our best and do better next time! The garden is where you'd love to be in Sorrento, instead of anywhere else. Unfortunately we could use it less than usual, for the weather wasn't really good as we would bet it could be. Usually the end of April in that area is kissed by the sun, not this year.. Let's hope for better luck in 2017. As for free coffee, along the years we experimented and asked for feedbacks many times, while hosting similar events in the beautiful Hotel Mediterraneo. By now, the most part of our attendees still prefer not to have an entrance fee, which would be mandatory to let people joining us and having coffee breaks, without reserving a room in the hotel. The hotel cafes are always available, in any case: having a coffee pause with your fellow sprinters, comfortably sitting by the pool or in the lobby, could be a nice way to strengthen relationships. The Odoo Sorrento sprint experience has been truly positive, and we'll do our best to organize a new Sorrento sprint in 2017. Let's hope with an even bigger and more active group of people! Abstract is a community of people who transform their passion into a profession.